The WSDOT Blog - Washington State Department of Transportation: How’s traffic in Seattle’s SR 99 tunnel? A little more than two months ago, the new SR 99 tunnel under downtown Seattle opened in the middle of a series of record-breaking snowstorms. The weather, combined with final SR 99 off-ramp construction, made it hard to know what kind of a traffic story was emerging in this new SR 99 corridor. Now that we have a few more weeks of data under our belt, we are starting to get a better picture of how many drivers are using the tunnel. During this toll-free time, what are we seeing? Tunnel usage is increasing over time. We are now measuring almost 500,000 trips each week (Monday-Sunday). The tunnel is seeing more than 70,000 daily trips Monday-Friday. The busiest days so far are Wednesdays, Thursdays and Fridays. Comparing the new tunnel's usage to usage of the Alaskan Way Viaduct is not an ‘apples-to-apples' comparison as the tunnel ramps are in different locations than the viaduct's ramps. 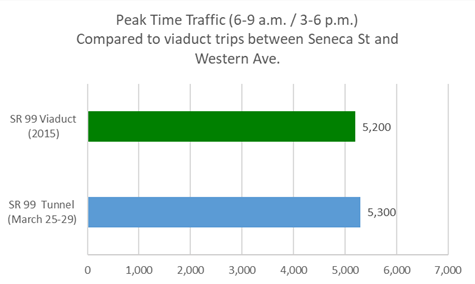 But comparing traffic counts between Seneca Street and Western Avenue suggests the tunnel is now carrying about the same number of vehicles during peak travel times as the viaduct did. We are required to collect tolls to help pay for construction costs and ongoing tunnel and maintenance operations. Tolling will start in late summer 2019 – after toll systems are fully tested and viaduct demolition is complete along Seattle's central waterfront. A Good To Go! pass is the only way to get the lowest possible toll rates - $1 to $2.25, depending on time of day. In the coming weeks, we will be giving away free Good To Go! sticker passes for SR 99 tunnel users. Sign up for email notifications to know when the free passes become available. After tolling begins, we expect to see a decline in drivers using the tunnel. However, based on the SR 520 Bridge and other toll roads around the country, we also expect to see a gradual increase in tunnel usage over time. The combination of the SR 99 tunnel and a new, rebuilt Alaskan Way were designed to replace the capacity of the viaduct. The City of Seattle expects to complete the new Alaskan Way in 2021. One thing is certain – given all the changes happening in Seattle, traffic patterns will continue to evolve as people determine their own best ways to get around. Hello, when will the on ramps at both ends of the tunnels be metered? They currently allow too much traffic in the tunnel at once which slows down all the cars in the tunnel. Also, there needs to be sign on roy street alerting drivers that they cant get on sr99 southbound and get off at harrison. The physical barrier separting the off ramp and tunnel trafffic needa to be extened north post roy street to prevent this. Will there be periods where the 99 tunnel is "Open to All" similarly to the express lanes on 405 during off peak hours?